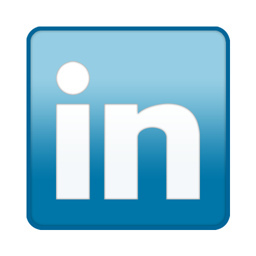 LinkedIn is one of the most recognized social network sites for professionals. 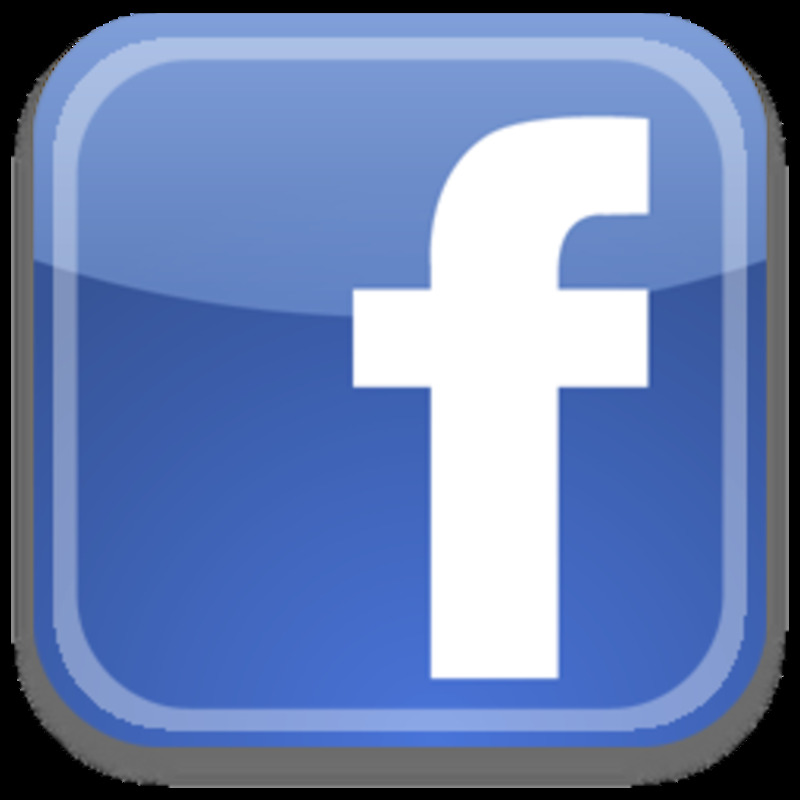 It is still used widely for actual networking, despite the massive growth of Facebook and what seems like billions of networks on Ning.com. I use LinkedIn daily, either to connect with groups, connect to colleagues, or do some prospecting. Because I use LinkedIn so heavily, its essential for me to keep my profile looking and functioning really well. It's easier than you think to have a profile that completely works in your favor - attracting clients, referral partners - and even driving tons of search engine traffic. 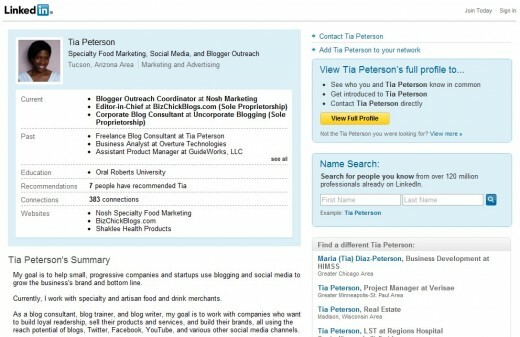 For a long period of time, I was using my LinkedIn profile to shoot myself to the top 3 and 4 spots on Google's page 1 for the term corporate blog consultant in my hometown of Tucson. In fact, that helped land me a great client! Make Your Headline Work For You! So choose this headline carefully. It is not just a place for you to throw a bunch of unrelated words, nor is it wise to be too hokey with it. It's certainly okay to use your brand's tagline there (if you are a solo-professional, etc. ), but pay close attention to the first few words in your headline, because this can make a world of difference when it comes to search engine visibility. 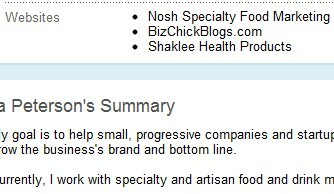 My headline (at the moment) reads, "Specialty Food Marketing, Social Media, and Blogger Outreach" because that describes the type of work that I do. Yours could be totally different. Just choose something that will work for you in the three areas above. Customize LinkedIn Website Anchor Text! That's because whoever owns that profile did not bother to customize those links. Why should I, as a visitor, blindly click on those things to try and find out what's behind My Website #1, My Website #2, or My Website #3? Notice in the image on the right, which is my profile, that the website URLs are customized. Not only is that really useful for search engine optimization, but it's crucial for getting people to click on them! Now, anyone who's interested in my special food marketing work can visit my specialty food marketing link. Simple as that. Scroll down till you see Websites on the left. Click 'Edit' next to one of the websites you've added. Clear out what you've got there. In the 2nd blank space, add your URL including the http. You can add up to 3 'Other' website links. The summary is not the most important part of your LinkedIn profile (your headline is) but it is certainly beneficial for you to go ahead and write something about yourself and what you're looking for in the summary section. My summary section includes 5 paragraphs, and they are written casually but professionally. I talk about who I am, who I currently help, a bit about my history, a bit about my professional philosophy, and some of my accomplishments. I conclude the summary section with another paragraph about how I can be reached. Remember, not everyone reading your profile is going to be on LinkedIn! So include your contact information. I also added common misspellings, which is really something that helps when people are searching for my profile within LinkedIn. Once your profile is finished, view the public profile (a link which you can customize, also) so that you are okay with the way it looks to the general public AS WELL as other LinkedIn members who are not in your network. If there is something off about it, go back and tweak and edit until you love it. If you're like me, you'll be tweaking and editing every few months. My profile is important to me because I use LinkedIn so often, and also because my profile comes up in search engines regularly. I want people to find me at 'my best,' so to speak. Questions? Leave them in the comments section. Hope you enjoyed this and it helps you out! Great hub - voted up. Thanks for the useful info. Applied it to my LinkedIn profile.